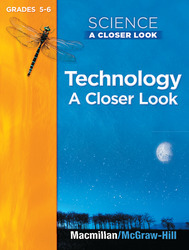 Macmillan/McGraw-Hill's Technology A Closer Look addresses state standards by providing instruction on technology, its development, its history, and its impact on society. All types of technology are covered, including media, transportation, entertainment, and medical. Included hands-on activities explore technological advances!